of marketing and product claims across your organization. Marketing and product claims are critically important to companies, helping to define functional product benefits, differentiate from competition, and support the brand. The process of developing claims, substantiating, and monitoring usage is complex, involves multiple stakeholders, and can involve significant regulatory and legal risk for companies. Many companies today are using disparate, manual systems such as spreadsheets, file share folders, and email for managing their claims process. There’s no single source of truth for approved claims, and comments and approvals get lost in long email chains. Marketing often may not have clarity around permitted claims or usage limitations. 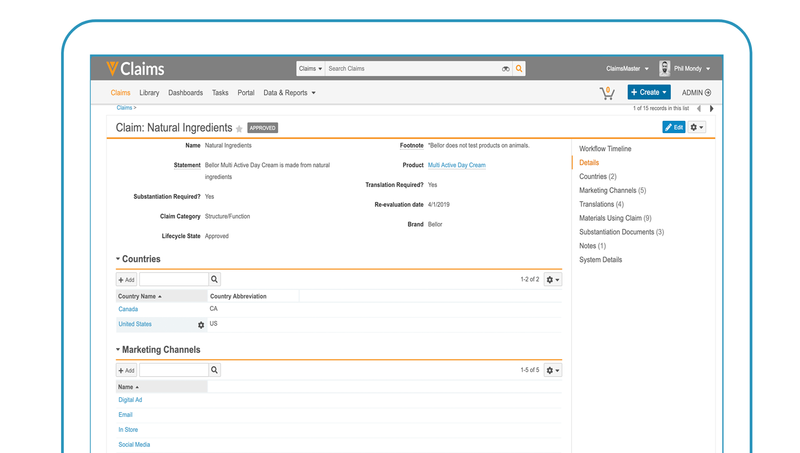 Veeva Claims is designed for legal and regulatory compliance professionals to manage the end-to-end process for claims. 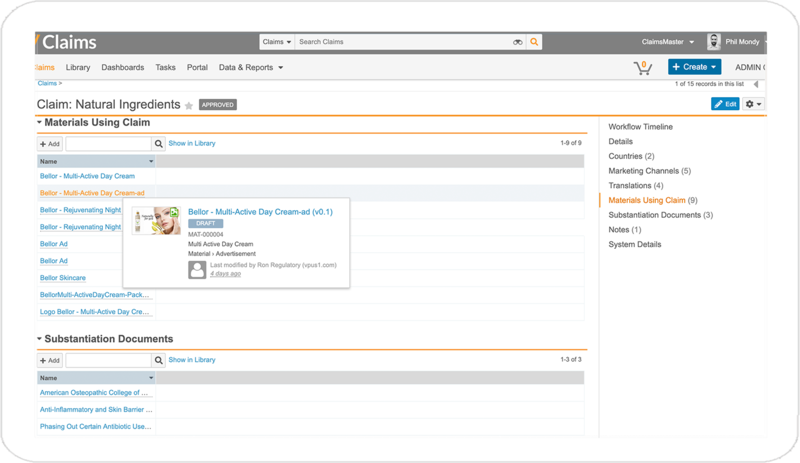 With custom workflows and audit trails, a centralized library, and dashboards and reporting, Veeva Claims helps companies reduce legal and regulatory risk, accelerate time to market, and protect their brands. 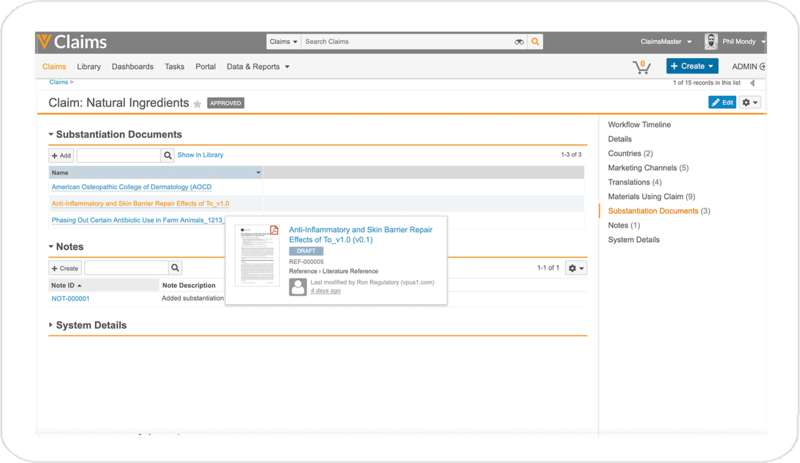 Reduced Risk: With auditable workflows, direct links to substantiation documentation and downstream claim utilization in assets, and a library providing a single source of truth for claims, you maintain a complete view of your claims and can respond to issues or challenges with a single keystroke. Faster Speed to Market: Custom built workflows, dashboards and metrics around the claims process, and a single location to store the latest approved claims for all your products enable more rapid development of new claims for product launches and reduced rework during legal and regulatory reviews. Get more done with less resources. Stronger Brand Stewardship: Bring greater clarity and control to the process of managing product and marketing claims throughout your organization. Reduce the probability of unapproved claim use, respond to challenges quickly and confidently, and protect the reputation of your brand. Click any of the links below to learn more about Veeva Claims' capabilities. Claims are stored in a central claims library, and can be searched, traced and reported on, and made obsolete - all at the click of a button. With Veeva Claims, you can be confident that your claims are current and compliant. Veeva Claims also stores all claims-related substantiation documentation or marketing content and assets utilizing claims. Everything related to a claim, easily accessible in one location. 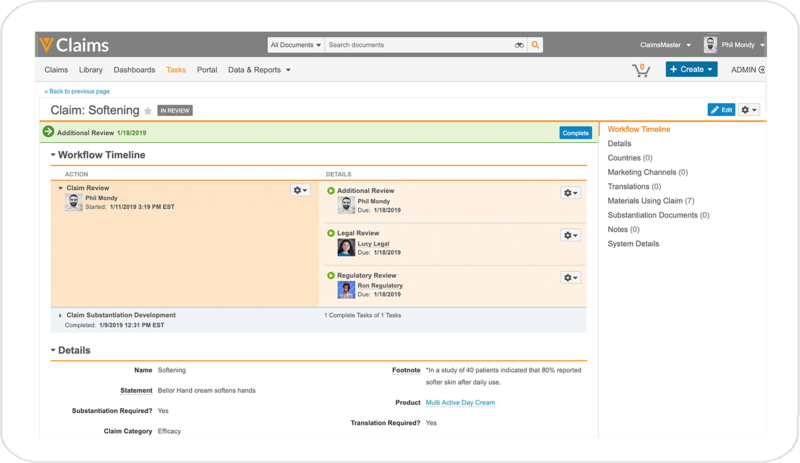 Veeva Claims workflows are tailored to the claims development and review process, and can be customized to your business needs. Multiple stakeholders with sequential or parallel task assignment and sign-off capability. Send for review, request substantiation, request changes, or approve, all with the click of a button. Audit trails and e-signatures provide a clear history of the end to end process. Claims can be linked to substantiation documentation as well as to all marketing assets utilizing the claim. If an issue arises with a claim, or a claim is challenged, you’ll have all the information you need at your fingertips to coordinate a rapid response. 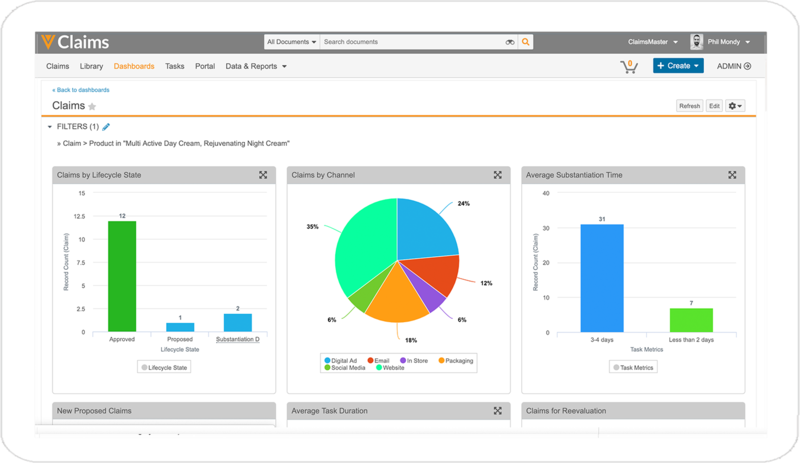 With predefined and fully customizable reports and dashboards, view all claims by lifecycle state, and drill down to brand, product, geography, or other parameter depending on your needs. Identify bottlenecks and areas for process improvement. Export reports and charts to share across the business.